An auricular is a C-shaped – ear shell like – decorative motif. 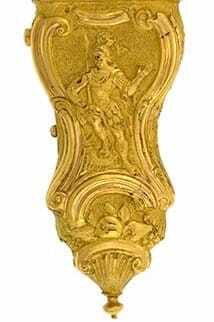 Evolving around 1600, the motif was used extensively during the Baroque period. Later, during the Rococo, it also occurred as an “S” shape. Auricular Motifs in a Pinchbeck Necessity Case, c.1750.